The ridicule has trailed him for years, in out-of-town gyms and on the NBA’s snarkiest message boards. 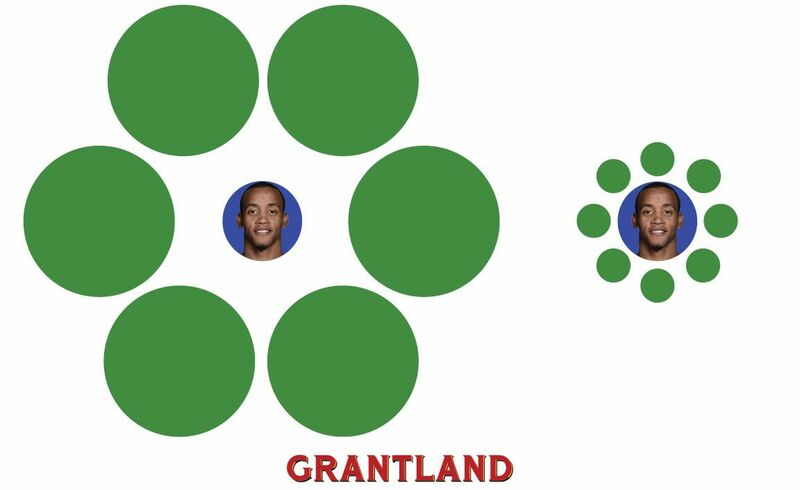 Perhaps no player has been mocked more than Monta Ellis. He shoots too much; he has never met a jumper he didn’t like; he’s a ball hog; he’s a volume shooter with an efficiency problem. I myself have been guilty of casting such aspersions. Well, although the samples are small, and the fresh season has just begun, Ellis might be rewriting his own story and teaching basketball analysts a very important lesson in the process. What if Ellis has a great year? Do we suddenly forget all that derision? Do we ignore all the words that writers have spilled since 2005 decrying him as a foolish player? Maybe we pat him on the back, call him the “Kia Most Improved Player,” and move on? I’m not sure, but through five games, Ellis looks like a different player, and if this keeps up — and I hope it does — I think it has the potential to present a scathing indictment on the state of NBA analytics. One thing that supposedly separates good and bad in the NBA is shot selection; good teams and good players take good shots, bad teams and bad players take bad shots. But while that’s true, the underlying origins of those behaviors are too often overlooked. The best offenses are capable of creating open looks on a regular basis. Good “shot selection” begins with good shot creation. During the 2013 NBA Finals it seemed like Danny Green was wide open all the time. He set the record for 3s made in the Finals by the middle of Game 5. For years, Gregg Popovich and his Spurs have done a marvelous job designing coordinated sequences of actions punctuated by an open player catching and shooting the ball from a good spot on the floor. Bad teams don’t do that, and as a result, players on those teams don’t get as many wide-open looks. Remember when Cleveland released the exact same Danny Green a few years ago? I guess he just couldn’t shoot back then. A vast majority of NBA possessions end with some kind of field goal attempt, but these shots often look differently in San Antonio and Miami than they do in Charlotte. Simply put, the league’s least-efficient offenses lose to their opponents’ defenses more frequently; these losses are commonly marked by a so-called bad or difficult shot attempt, and as a result, shooters on these teams never put up efficient numbers. Still, the bookkeepers of our beloved team sport remain happy to assign and assess things like field goal percentage, assists, and Player Efficiency Rating to individual players regardless of context. Ellis has never really played for a good team. But he’s in Dallas now, and he suddenly finds himself playing for Rick Carlisle and alongside talented veterans like Dirk Nowitzki, Vince Carter, Shawn Marion, and Jose Calderon. His PER is the highest it has ever been, and through the first week of the season it looks like Ellis is a new player — but he’s not. The inconvenient truth for analysts is that he’s the exact same human being just splashed into an extremely different, and much more efficient, ecosystem. Monta Ellis is creating 24 points per-game on the pick and roll this season, the most is the NBA this season by a significant margin. One of two things is happening: Either Ellis is the breakout star of small-sample-size theater this year and a regression is coming, or he is in the process of demonstrating something that seems so obvious I hesitate to even write it: Playing for a good team makes individual players appear better, while playing for a bad team makes them look worse. To this point, even our most advanced stats neglect that most basic notion of basketball ecology. I’m not saying Ellis will undoubtedly be great this year, but it will be absolutely fascinating if he is. Until this month, Ellis, on most counts, was a laughable jump shooter with a bad volume habit — one of the league’s princes of silly jumpers. But maybe we need to consider how he became bad shot royalty. It seems clear that there are dozens of potentially productive players in the league who are currently struggling within mediocre systems and would exhibit drastic “improvements” the minute they got to play in better situations. The fact that many of these same players are maligned is troubling. A few decades ago baseball sabermetrics had its revolution in part because analysts realized the game was only technically a team sport, and that it was more aptly dissected as a sequence of outcomes that involve sovereign performers competing in one-on-one encounters. But basketball exhibits the exact opposite nature and is in desperate need of a very different kind of analytical revolution. Unlike home runs or strikeouts, almost every basket, made or missed, in the NBA is the product of teamwork — coordinated and connected actions by multiple actors behaving (or in some cases, attempting to behave) as a unit. As a result, every basketball analysis that fails to account for the natural ecology of the game is inherently flawed — and to this point, almost all “advanced” analyses make no such ecological considerations. There’s no way to accurately characterize an individual basketball player without considering his situational habitat. Yet this is what we all do on a daily basis. We constantly cite individual basketball stats like points, field goal percentage, and assists as if they were home runs. I am as guilty as anyone. 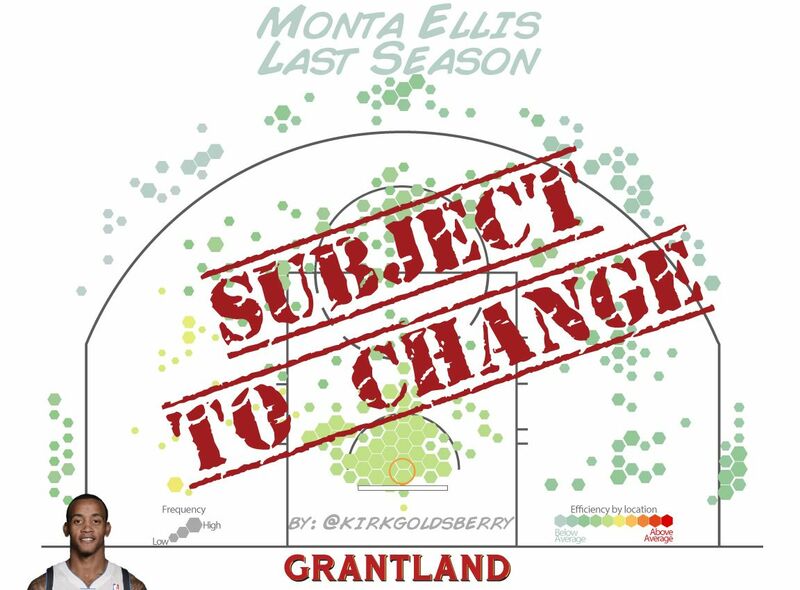 Ellis’s shot chart from last season is horrible, there’s no doubt about that — but what does that actually tell us? It tells us he was very active and his shots from the field went in at below-average rates, which is true, but that’s not the whole truth. Part of the problem is that our spreadsheets can’t handle the truth. Don’t get me wrong, Ellis has taken hundreds of ill-advised shots during his career, but some of them are the result of his environment. When you are a quick, creative shooter on a team that lacks offensive firepower, guess who has to generate field goal attempts from scratch? Guess who they pass the ball to at the end of the shot clock? More than any other major American sport, the NBA is all about individual players. “Jordan! Malone! It’s the NBA Finals on NBC!” As such, it is very tempting to construct an accounting framework that spews out cheap factoids, mimics that marketing blueprint, and feeds our endless fascination with individual players. However, as Ellis is threatening to tell us, that kind of approach is dangerously simple, and we should be wary of bestowing the accomplishments or failings of an entire ecosystem on one of its member species. Zaza Pachulia Is Buying the Bucks' Court. No, Seriously.